Located 7 miles (11 km) southwest of Duns and 12 miles (19 km) northwest of Coldstream, on the Blackadder Water, Greenlaw was built in the late 17th Century and functioned as the county town of Berwickshire for 207 years until 1903, a title it shared with Duns after 1853. Its Market Cross (1696) and Kirk (1675) are its oldest structures though the cross was removed for most of the 19th century and is now west of the Kirk. 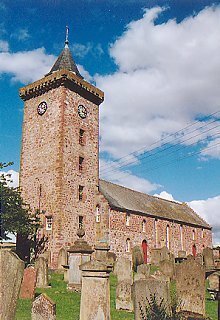 The last public hanging in Scotland took place at Greenlaw Kirk in 1834. Hume Castle (13th century), 3 miles (5 km) south of Greenlaw, was the seat of the Home family; destroyed in the 17th century, it was restored in the late 18th century.